Not quite bored, not quite occupied. Happy Spring Holidays to all! Don’t you love it when the gods’ schedules are synched? At least Greek Orthodox Easter is next Sunday. Living in Israel when major holidays overlap is always crazy. That’s why we’re avoiding Jerusalem until the very end when everyone else has already gone and it will be somewhat calmer. Friday was spent cooking so much food. But we had plenty of guests over for the Seder and so most of the food was eaten. But then I had to go shopping to replenish the food that was eaten, and now I can’t find the shelves in my fridge. Most of the food was standard fare, but I made special-for-Passover brownies originally posted on Lulu and Lattes that our guests called “Sorcery” – mostly because they didn’t taste like Passover. When you have a holiday where even scrambled eggs taste different, making something that tastes like a regular food item is key. 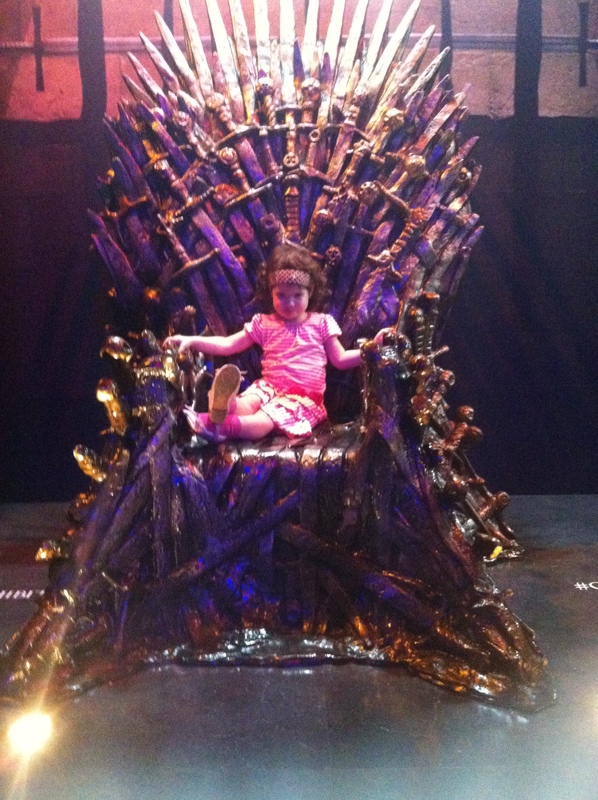 Yesterday I, Hubby, Nooshkin, and Stinky Face went to the Game of Thrones Exhibit in Tel Aviv. It was pretty cool and there were many opportunities for my inner nerd to be very happy. 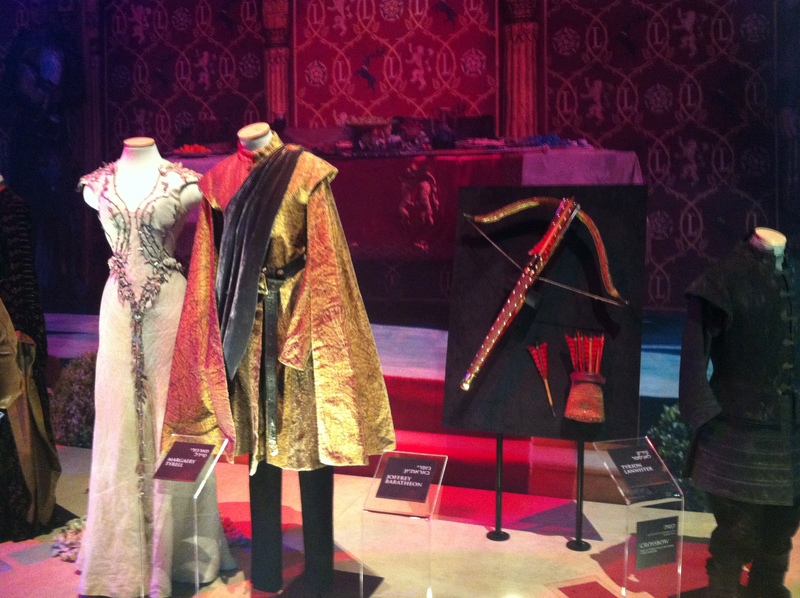 The Exhibit is here for the rest of the week, but there were a limited number of tickets available. Naturally, this didn’t stop people from trying to get in anyway – so there was a separate entrance for people who didn’t have tickets. But we were smart and ordered the tickets as soon as we found out this was happening, which was three weeks ago – go planning ahead! 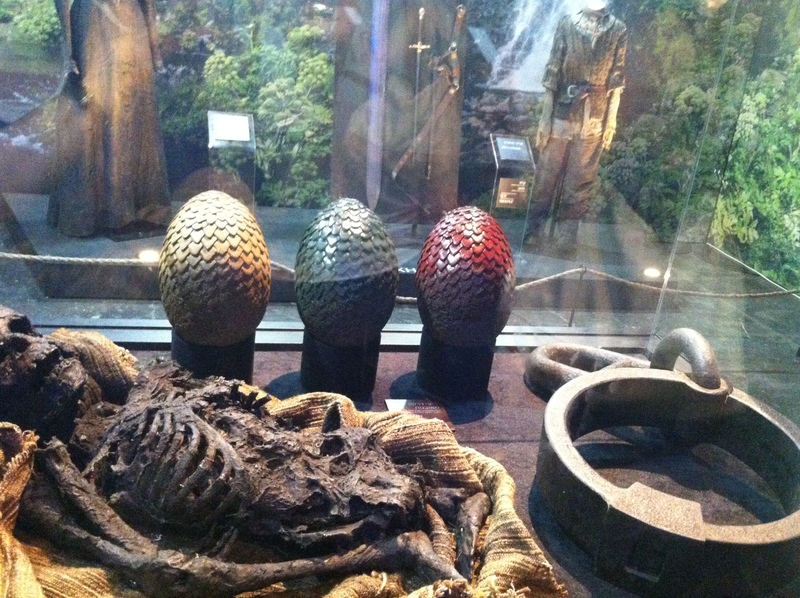 There were some costumes, props, and interactive stations where you pretend to get burned by a dragon or turned into a White Walker. The lines were kind of long, so we didn’t do them. 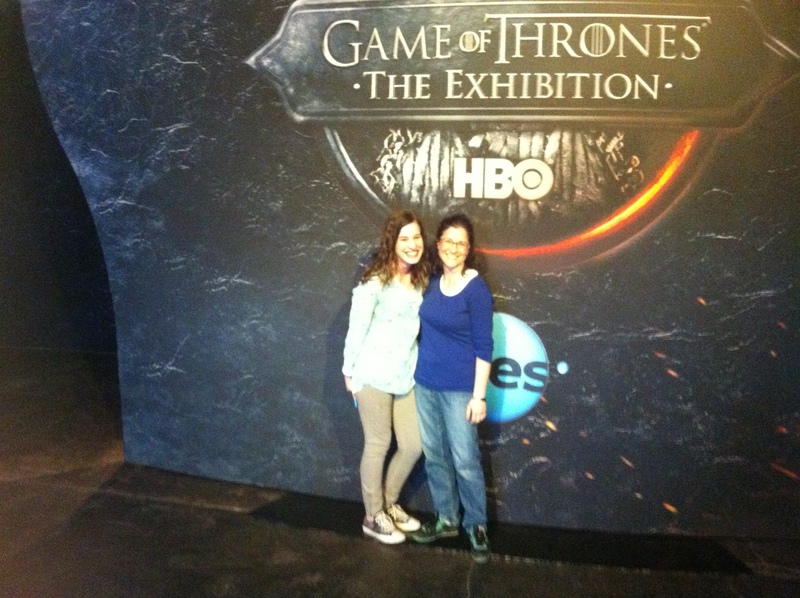 The only line worth waiting in was for the Throne. This line (surprisingly) went pretty fast, but that’s because there was an actual bouncer whose sole job was to kick people off the Throne so everyone else could have their turn. We also walked around the Tel Aviv Port a little, but it was getting dark and cold (and we got caught in some spray) so we didn’t stay too long. Nooshkin and I are hanging out today and we will probably wreck havoc around the neighborhood after wrecking havoc around the apartment. Preheat oven to 375; Grease a 9×13 pan. Mix ingredients together and spread in pan with spatula. Batter will be thick but do not add water. Just mix it well. Bake for 23 minutes. — OR — Shape into cookies and bake 12–15 minutes. Do not undercook. #GOT adulting alchohol baking blogs busy calm children choices cleaning craziness Dr. Seuss education family food fun future Game of Thrones gif goals happy hashtag high school history holiday Holocaust housework Israel jetlag Jewish job hunting job opp link MadMen meme music OMG! parenting peer pressure philosophy picture Pirates play date Q&A quote reality reality tv recipe remember restless reunion road trip school social media soldiers sorry soul stress success superhero surprise! sushi technical The Big Bang Theory Times of Israel travel treat yo'self USA vacation veterans waiting wedding work writing y no work? Life as a Rambling Redhead. Surviving motherhood with sweet baby laughs, wine, and sarcasm. Delving into the world of fantastic baking!